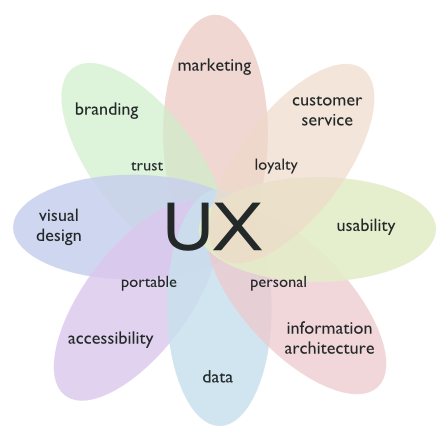 User experience (UX) is a convergence of many disciplines. It goes beyond making something just easy to use or visually pleasing, but looks after all the aspects of a person’s interaction with a product or service – and most importantly, how they feel about using it. All these forces need to work together to present the customer with a harmonious and consistent experience, so that if the brand sells simplicity, the software really should be easy to use, and this will reflect back on the brand and re-enforce its message. When this harmony breaks down it damages the brand, and the emotional aspects of the user experience like trust. I’ve noticed this several times with Orange the mobile phone company – when I subscribed to a mobile plan via the Orange website, everything worked fine, but when I had a question about my handset and went into my local Orange shop to ask advice, they said “bought it from the website? Nothing to do with us”, and turned their backs! Now, Orange went to a lot of effort to make the visual branding of their website, shops and printed marketing identical, so as a customer I’m thinking Orange is Orange no matter where they are. Unfortunately their internal business structure and customer service procedures don’t reflect their brand message, which means my user experience is very inconsistent and they seem like a less credible company. Nice graphic. I suppose someone has mentioned the “loyalty” misspelling in case you want to fix it? Thanks for the heads up – Fixed now. Where do you see the interation between UX and the IT or business processes underneath? and where do you place the why/how/what?